Fans spend hours trying to figure out the often cryptic lyrics of Ronnie James Dio, one of the best heavy metal vocalists to ever attack a microphone. With a vast catalogue that spans stints with Black Sabbath, Rainbow, Dio and assorted side projects, there is ample opportunity to dissect Dio's message. The Last in Line is one of Dio's most analyzed songs with most people agreeing that it has to do with the concepts of good and evil, the morality-based decisions that we as humans must make on a daily basis and the consequences related to those decisions. That certainly is a sound theory. But when CTN recently heard The Last in Line -- while listening to the satellite radio running some errands -- CTN realized that The Last in Line also applies perfectly to the Stanley Cup Playoffs. In fact, CTN used this song to describe the New York Islanders, the last team to make the Eastern Conference playoff party, in last year's lyrical preview of the Stanley Cup Playoffs. No, look at the lyrics again. Dio's message is one about the search for truth and how it changes us as human beings. Each decision we make goes toward defining who we are as a person. The Stanley Cup Playoffs are a similar quest for truth conducted by hockey players. That two-month journey is the crucible that often defines a player -- for better or worse. His actions on the playoff stage shape him in not only the eyes of others, but on a much more personal level, also in his own mind. To a degree, they provide his professional self worth. Is that harsh? Perhaps. But, it is also a reality. So, the Stanley Cup Playoffs are an unbelievably personal journey despite the fact that more than 300 playoffs begin the quest each spring. Each player will be tested along the way in ways he never imagined. There is no way to prepare for the journey, either. There are no books to be read, no experts to be consulted. It is truly a trial by fire. It is a trial that can be all-consuming and painfully revealing, but intoxicating nonetheless. Ask any player that has been hardened by the crucible of the Stanley Cup quest if the sacrifices are worthwhile. The overwhelming answer is yes. The magic that hockey players feel as they chase the most-coveted trophy in sports throughout a seemingly endless odyssey is worth a lifetime -- a lifetime of memories. So, with that said, CTN thought it would be interesting to identify some first-time playoff performers who have shown a readiness to embark on this life-changing journey. CTN would love to hear your thoughts on the upcoming Stanley Cup Playoffs, Ronnie James Dio or anything else. Just drop Crashing the Net a line at roarkeblog@nhl.com. Remember to include your name and hometown. Here are some first-time playoff performers who have a chance to not only handle the rigors of the Stanley Cup quest, but also make the perilous journey in convincing fashion. Keep an eye on these Stanley Cup rookies, who are presented in alphabetical order. Note: Only players from teams currently in the playoffs, or within two points of a spot, were considered for this list. David Clarkson, New Jersey -- This young man's game is meant for the playoffs. He is all straight lines and all-ahead-full attitude. Challenges are nothing new for this budding power forward. He has been challenged -- and challenged others -- all season. Sometimes, it is hard to remember he is a rookie. 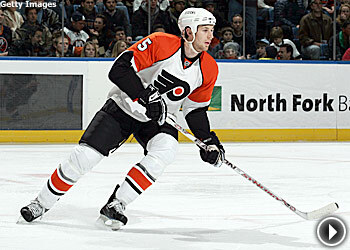 Braydon Coburn, Philadelphia -- Big, physically intimidating defensemen are valuable currency in the postseason. Big, physically intimidating defensemen that can skate are even more valuable. Coburn, who has 34 points and a plus-18 rating this season, falls firmly into the latter category. Brandon Dubinsky, Rangers -- Dubinsky refuses to be overshadowed on a team full of marquee names. Nightly, he draws something to be noticed. Playing in New York, at Madison Square Garden, is the perfect apprenticeship for the playoffs. Plus, Dubinsky has responded to top-six forward responsibility, always a good sign. Jeff Finger, Colorado -- The 28-year-old Finger put in almost four years at the American Hockey League level before getting a chance to be a full-time player this year. He hasn't fumbled his shot at handling the blue line at the NHL level and plays a no-frills game that is the staple of playoff game plans. Tim Gleason, Carolina -- In his third NHL season, Gleason is finally starting to deliver on the potential suggested by his first-round selection. Gleason is a big body on the blue line that does a little of everything. He can put up points, he can defend and he can mix it up along the boards and around the net. 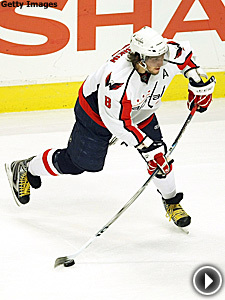 Mike Green, Washington -- Here is a player that is hitting his stride at just the right time. While everyone focuses on Alex Ovechkin and his role in reviving the Washington franchise, the Capitals would still likely be bottom feeders if not for Green's ability to run the show from the blue line. He has a little Brian Leetch in him. Even though Josh Harding Is Minnesota's backup goalie, he has proven he can handle the pressure and workload for them. 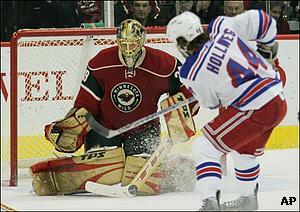 Josh Harding, Minnesota -- We all know that Niklas Backstrom is the No. 1 man for the Wild, but don't think for a minute that Minnesota isn't a wee bit more confident about making a long run with Harding in the backup role. He has proven that he is capable of handling the load and pressure games. That can make all the difference if Harding is pressed into postseason duty. Jaroslav Hlinka, Colorado -- At 31, Hlinka is among the oldest players set to make his playoff debut. Along the way, Hlinka has built up a wealth of European playoff experience, including a point-per-game performance during Sparta's 16-game run through the Czech postseason. Will that translate to the NHL? CTN thinks it certainly will, especially in Hlinka's current role as a support guy. Tyler Kennedy, Pittsburgh -- Anybody that puts on a Penguins sweater this spring has the chance to be a hero. Why? Because there is just so much talent up front that it will be hard not to put up impressive numbers. Kennedy has shown signs of having the offensive creativity to handle duty with the loaded top-two lines. But, his effectiveness may be damaged if Gary Roberts returns and Kennedy is relegated to a lower-line role. Andrei Kostitsyn, Montreal -- This Belarusian left wing can score goals. It's that simple. He is one of four Canadians who has 20 or more goals and his ability to deliver scores will be counted on as things tighten up in the postseason. Kostitsyn is a key to Montreal's top-rated power play, which is always a difference maker in the postseason. And, let's not forget his five game-winning goals. Torrey Mitchell, San Jose -- Only one Sharks' forward sees more shorthanded action than rookie Mitchell, who averages more than 2-1/2 minutes on the penalty kill per game. His ability to kill man-advantage situations will be important to the Sharks, as will his speed, positional soundness and ability to chip in with the odd goals here and there. In fact, Mitchell seems to have the perfect skill set for playoff hockey. Doug Murray, San Jose -- The 28-year-old Swede loves to hit, loves to block shots and loves to mix it up with opposing forwards. Simply, he likes to play the greasy style of hockey that coaches crave and demand in the postseason. He has shown little fear of anything in earning full-time duty, despite long odds against him. So, he clearly has the mental makeup necessary. And, oh yeah, he is a team-leading plus-19. Matt Niskanen, Dallas -- This young man, in his first season of NHL duty, has been asked to mature faster than anticipated because of injuries to more experienced members of the blue line, especially Sergei Zubov. Niskanen didn't blink an eye. He has been solid defensively, even seeing some time on the penalty. Offensively, a 30-point season is not out of the question. Those are good numbers for a five-year veteran. Alex Ovechkin, Washington -- "AO” is made for the playoff stage. He is all about bright lights and big crowds, making the moment his own. If his Washington Capitals aren't able to make the postseason, it will be one of the biggest disappointments of the season. He needs to put his skills and enthusiasm before the biggest possible audience. He will certainly own the postseason when he reaches it, just as he now owns the regular season. Carey Price, Montreal -- Price better be able to carry the load in Montreal, or there will be a lot of incensed Canadiens fans. Obviously, GM Bob Gainey likes what he has seen from his rookie goalie. Otherwise, he would not have traded Cristobal Huet and handed over the job to a player with all of 34 NHL starts under his belt. So, will Price become the latest young goalie, following Ken Dryden and Patrick Roy, to carry the Habs to glory? Certainly his resume of winning at other levels suggests he is the man for the job. Tuomo Ruutu, Carolina -- Ruutu was traded to Carolina at the deadline because he was underachieving in Chicago. He has shown signs of finding himself with the 'Canes, registering five points in his first nine games with his new team. When Ruutu is on his game, he is a bear with which to deal. He is a big, ornery, relentless force that would just as soon run over someone as go through them. Carolina will welcome that jam if it somehow shows up this spring. Marc Savard, Boston -- This veteran center has 574 points in 657 NHL games, yet he has never played in a postseason game. Is it bad luck that has doomed Savard to a lack of big-game hockey? In part, CTN guesses. But, he also has been a leading light on some very bad teams. Now, he should get a chance to shed his non-playoff status with this year's Bruins. It will be interesting to see what the 30-year-old does with the opportunity -- his first postseason experience since reaching the AHL playoffs back in 1999. Fredrik Sjostrom, Rangers -- New York obviously liked something about Sjostrom, trading for him from Phoenix at this year's deadline. Now, the rest of the hockey world is getting a glimpse of what Sjostrom brings to the table. He has scored two goals in his first nine games with the Rangers, which is close to a 20-goal pace for a full season. He has slotted in beautifully as a lower-line energy guy, spreading the Rangers talent a little deeper and making the team tougher to match lines against. Marc Staal, Rangers -- He clearly has the adaptability genes that his older brothers -- Eric in Carolina and Jordan in Pittsburgh -- used so expertly in their transition to the NHL game. The 20-year-old Staal has missed just two games this season and has improved on an almost nightly basis. The coaching staff is not reticent to match this Staal against top players and he has responded brilliantly. In fact, Staal has only been minus in 19 of his 71 appearances this season -- a very impressive rate of success indeed.